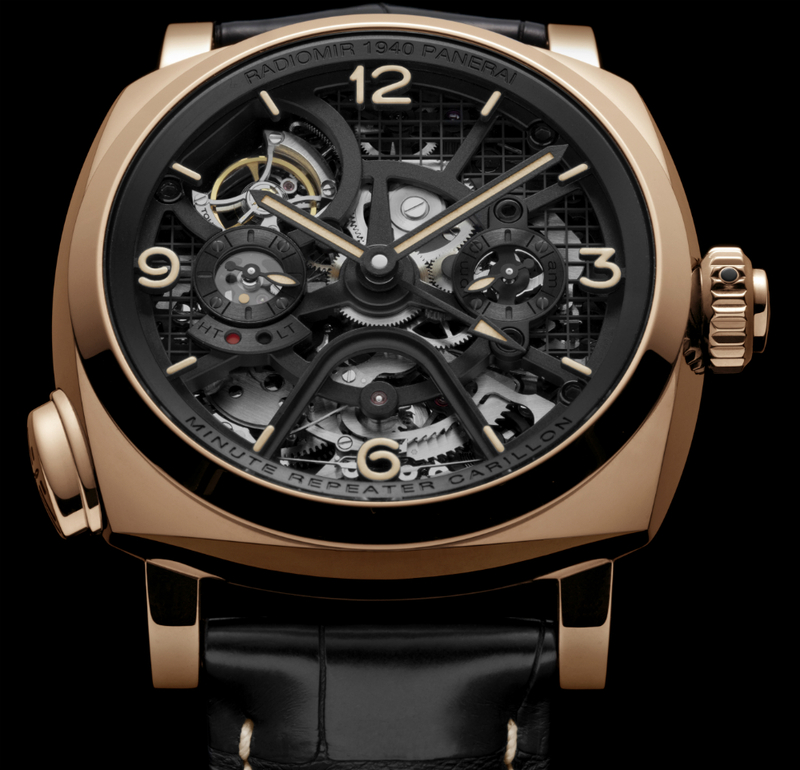 Panerai has been busy this year – unveiling great new collections that range from skeletons to tourbillons and the all-new Due collection, which we wrote about here, with new case shape just unveiled last week in Florence, Italy. However, the watch that made us stop and tilt our heads just a little is the brand’s most complicated watch to date: the Made-to-Order Radiomir 1940 Minute Repeater Carillon Tourbillon GMT. This masterpiece was officially unveiled to the world last week in Florence, as well, at an exhibition that showcases the brand’s rich history in horology. So, back to the new uber-complicated melodious watch. Officine Panerai, with Italian roots and great underwater history, just doesn’t seem to be the type to need a minute repeater in its line up. So – yes – we did do a double take. However, upon closer inspection and reflection, we understand exactly why the brand has built this timepiece and is touting it for sale on a made-to-order bespoke allotment only. 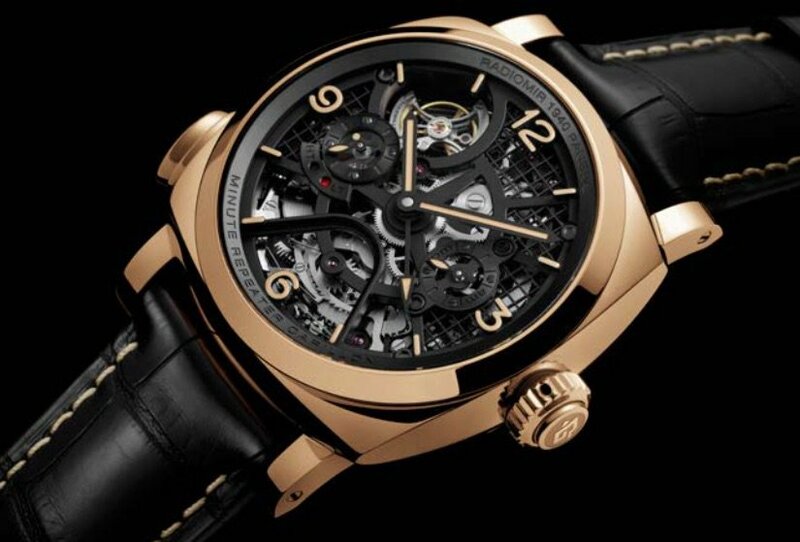 1 –To begin with, the watch is incredibly complicated in its technology and mechanics, which include a three-hammer double repeater mechanism – yes two separate repeater mechanisms, each with three hammers, in one watch — that enables it to chime either a local or a second time zone at will. The wearer can even easily switch between the two time zones via a pusher on the crown when it is in selector mode. Powered by the new hand-wound skeletonized P.2005/MR manufacture-made caliber, the watch chimes the hours, 10-minute increments and minutes. Additionally, the tourbillon escapement features a unique system wherein the rotation of the tourbillon cage is on an axis that is perpendicular (instead of parallel as in most classic tourbillons) to the balance axis, and rotating at 30 seconds. It took the master watchmakers at the brand’s Laboratorio di Idee four years to develop the P.2005/MR caliber. 2 – Personalization. Watch collectors and enthusiasts love to own a watch that has their own personal stamp on it – whether that is the color of a strap or the choice of hands. By offering this watch as a custom-made piece, Panerai gives Paneristi the ultimate right to have it their way. The brand is offering a choice of hands, straps and (not yet decided) case materials. 3 – Pricing. The 49mm watch, as shown here in 18-karat gold, retails for about $400,000 – a step up from the average Panerai price point. Additionally, depending on the buyer’s choices when it comes to customizing the watch, retail pricing can go higher. Of course, Panerai had to build the watch. It simply further underscores the brand’s commitment to precision, perfection and performance.